With diminishing refinance pipelines, the Loan Officer's need to really build purchaser relationship has increased. We are so used to taking orders and plopping loans into automated underwriting, though, that we have missed the real opportunity that the first customer call presents: a real pre-qualification is the ultimate customer closing tool. Pre-Qualifying is the process of analyzing what a borrower can afford before he or she enters into a purchase agreement. 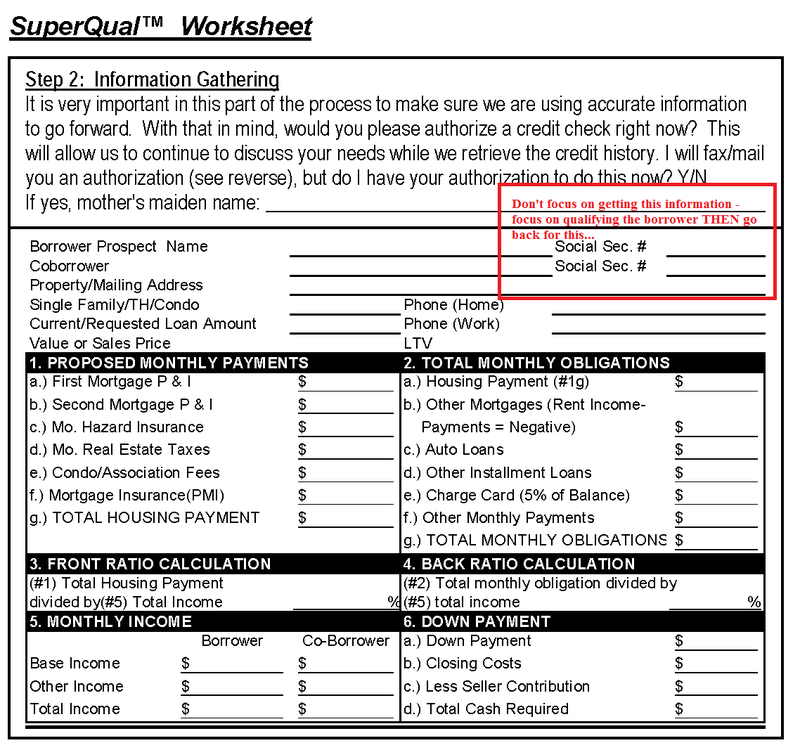 Qualification is different – the borrower already has a property, and the loan officer determines if the borrower can afford the specific property. Pre-Qualifying means the borrower hasn’t found a property yet and is relying on the loan officer for advice as to how much he or she can borrow. What is overlooked in this process, whether Pre-Qualifying or simply Qualifying a borrower, is that the process is a part of the overall needs analysis for the customer. It is through the qualification discussion that the loan officer can advance all of the options the customer has. It is this contemporaneous, on the spot analysis that allows the loan officer to demonstrate competency and help guide the customer to a loan choice that really suits their needs. It is also true that the more time the borrower spends on the phone with the loan officer, the better the loan officer’s chance of getting the loan. Proper Qualification of the borrower is tantamount to this process. The first thing the borrower needs to understand is the difference between pre-qualification and pre-approval. A sales pitfall, that is not unique to loan officers, is the assumption that the borrower knows, or is familiar with, most of the information they will encounter as a borrower. In fact, no one likes to admit that they are ignorant about something. This is particularly true of borrowers who have experienced the loan process several times. If you are a loan officer you know that it may take months or even years of constant exposure to the mortgage business to really understand the home financing options, and process. As a result the loan officer should treat every application or pre-qualification interview as an opportunity to educate the customer. This is true from the simplest detail, such as explaining decimal and fraction equivalency. In the situation of the pre-qualification the physical calculations should be revealed to the borrower in the way that the loan officer is actually walking through the math him or herself. Thank you for taking the time to speak with me. Are you purchasing or refinancing? We want to identify the transaction type before we proceed. Generally, borrowers do not have to be pre-qualified to refinance. For refinances we will proceed to product selection questions shown below. Sales Price? How much are you putting down? How many points is the seller paying? Do you understand that, if you do not have a property that you have a contract on, you can’t really lock into an interest rate? This is still the best time to discuss financing options. Yes - If the borrower has found a property, identify whether they have written an offer, received offer acceptance. No - If they have not found a property the borrower needs to understand that they will not be able to lock an interest rate in yet. The first step in making sure we select the best product for your needs is to make sure you are able to afford the payments. We call this pre-qualification. Do you have a moment to do this now? I really must insist on doing this because if there is a problem with obtaining financing I will be held accountable. 2.) (If property is not selected) how much loan you can afford. a. Based upon this analysis you can afford $____. We also need to make sure that your debts do not substantially change the computation. Does this information meet your expectations? 1.) If the borrower agrees, then you qualify him or her first to income, then total debts, sharing your results as you make the calculations. Obviously, if you have exact information for real estate taxes you will use those. 2.) Upon completion you can discuss the benefits of pre-qualification, and offer a pre-qualification letter. b. You can tailor the letter to meet the terms of any offer they make. 3.) The calculations may reveal that the ratios are too high for standard guidelines (28/36) or that the borrower cannot qualify for as large a loan as they want. This is EXACTLY what you WANT to reveal. Satisfied - Now that you know that your qualification profile is in line with the financing you are seeking you should understand that the pre-qualification letter is limited. Do you know what a Pre-Approval is? Dissatisfied - Since we have a shortfall with results of pre-qualification, you should know that we have several solutions for you to help you qualify for more. Would you like to discuss these? I understand that you aren't ready to provide this information yet. I still need to make sure you are suitable for the transaction you are proposing. I can do this in a process we call Reverse Qualification. Do you mind if I do this now? What is the sales price you are looking at? What is the down payment? Based on this information you should have income of $_____ a year to afford this property. Is this what you earn? Is it more or less? Often, a borrower will resist pre-qualification, or giving income and debt information thinking the loan officer is trying to trick him or her into revealing more information than they are ready to. This does not mean that the borrower should be allowed to avoid this segment. The reverse qualification allows the loan officer to expose qualification problems without getting income figures initially. If the borrower has sufficient income, you can proceed. However, if the borrower has more income than what is needed, the loan officer should demonstrate the maximum qualification first. If the borrower has less income than needed, follow the instructions for Dissatisfied above. Now that the Pre-Qualification Phase of the Needs Analysis is complete, the loan officer can proceed to determine program suitability. On any given day someone else will probably have a lower rate and/or point quote – or another loan officer will lie about the actual rate they offer. We are perpetuating the borrower’s belief that asking about the interest rate is the most appropriate question. The borrower thinks if one rate is good a lower rate is better. By comparing many different products and features the borrower will see that there are more important aspects of the comparison than the rate. Purchase - Do you currently own your home? If yes, what kind of loan do you currently have? What is your current payment? Are you going to sell your current home? These are all situational questions designed to give you a sense of what the experience level of the borrower is. Most borrowers have some familiarity with a fixed rate regularly amortized loan. One of the features of the fixed rate loan is the ability to pre-pay the principal in part. Do you understand how this works? This is similar to the bi-weekly mortgage, where instead of making twelve monthly payments, you make 26 bi-weekly payments amounting to an extra payment a year. Do you see how this works? One of the features of a fixed rate loan is the ability to permanently discount the interest rate by paying points. Have you considered paying points? Are you going to be in this property at least _____ months? If not, you should really consider an alternative to a long term fixed rate because you are paying for insurance you don’t need. Have you heard of a balloon loan? If you were looking at a shorter-term stay, have you thought about which Adjustable Rate Mortgage might best suit your needs? Do you understand how ARMs work? If you were renting, and you are considering buying you may notice that the payment for the mortgage is significantly more than what you were paying in rent? Had you looked at the tax benefits of your proposed purchase? By embracing pre-qualification, you will spend more time talking with the customer about what's important to him: HIM. You have proved your value and this will make it more difficult for the borrower to continue shopping for the lowest rate.